"DRIVE YOUR GOLF TO ANOTHER LEVEL"
The past few weeks have been a busy time for club re gripping, probably due to the warm weather the grips effectiveness can be pronounced if already "slick". Every time I receive a set of clubs I ask a series of questions to narrow down and ascertain the specific grip styles to offer my customer which ultimately comes down to the clients choice regarding comfort and feel but guidance is required initially. I have used Golf Pride grips for the past 25 years both as a former Tour player and now continue to offer the number 1 grip on the PGA tour to my clients. As a regular visitor to the PGA Golf show in Orlando it is the perfect opportunity to view the new products ahead of time offering my customers the up to date models and information. One new client was using a Golf Pride Multi compound on her driver and commented that her hands were feeling very sore after 18 holes. I would personally offer these top quality grips to players who prefer a much firmer feel and do not wear a glove, the half cord hybrid grip certainly assists in wet conditions, the weight of the grip can also affect the swing weight of a club and feel which must be relayed to the customer. I was able to recommend and fit the Golf Pride Tour wrap undersize grip which were the ideal size and fitted the requirements of a softer and tacky grip which she loved! I fitted the new Golf Pride CP2 Pros on my clubs due to a hand complaint and can't believe the difference it has made to the overall comfort combined with the parallel feel really enjoy using this new model. As a result I will be offering these to my customers who have arthritis with the added benefit of Mid size and Jumbo models. 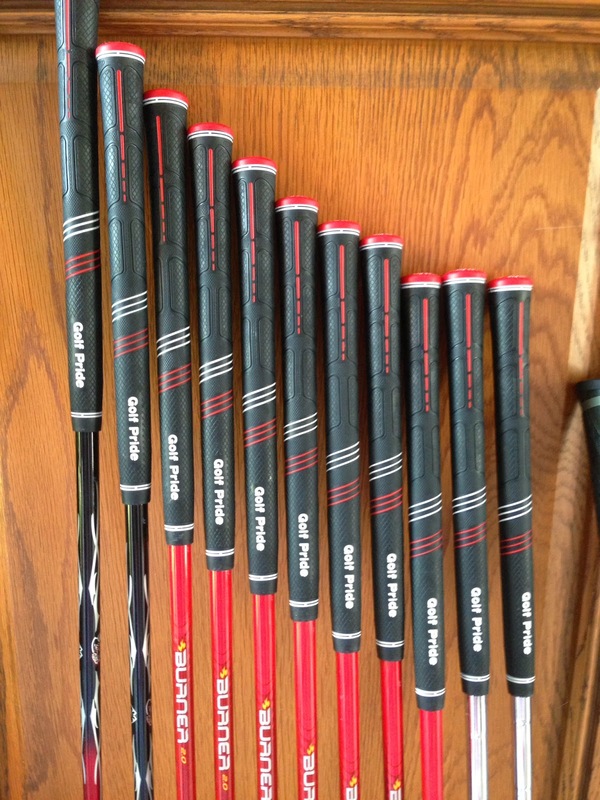 Golf Pride CP2 Pros " A hot grip"
When you have your next golf lesson it is worth asking your PGA Professional if you require new grips and seek their Professional advice as to the size and composition. "If it's raining or snowing would you drive with bald or slick tyres?" You should not play golf with slick or worn grips either! Prolong your grips life by washing them in soapy water and scrubbing to remove the natural oils we transfer from our hands. 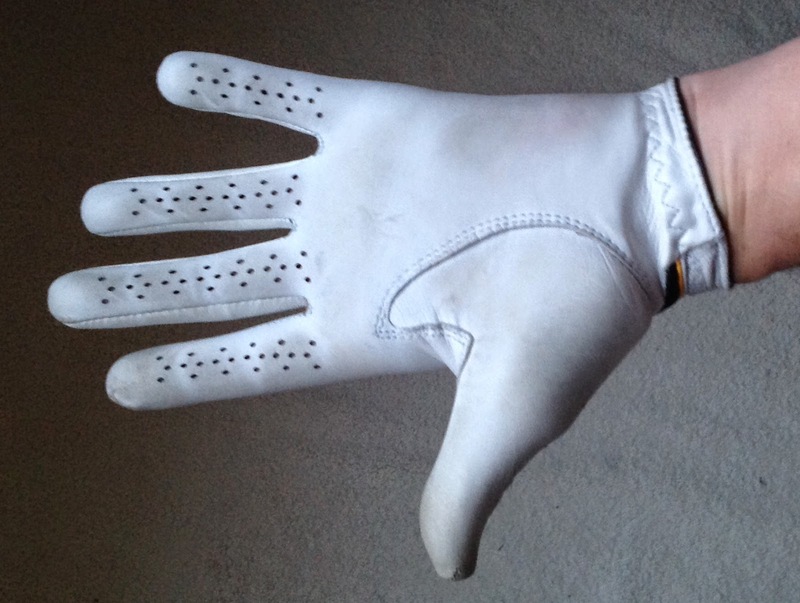 Take care of your Grips and "grip with confidence"
Your golf glove will reveal all.. The golf hold is one of the most important aspects of the game and in my view it is essential that the separate components are understood completely. It is vital that regular check ups are made with your golf Professional as many swing faults can be directly attributed towards an inconsistent hold. A grip change, as you may already be aware is one of the hardest areas to change as it is the only point of contact with the club and even the slightest alteration can feel so uncomfortable and unnatural. There are a number of elements that I mention to my clients regarding the hold with the following two areas relevant to this article. The hold position affects the clubface position during the backswing which can have a knock on effect on THE most important part of the swing which is when the club face strikes the ball. In Fig 1 the glove shows me immediately the club is being held too much in the palm of the left hand instead of the fingers. The additional wear marks on the thumb and index finger demonstrate increased pressure combined with friction created during the swing indicating that the thumb is not ideally positioned and the club held too tightly. 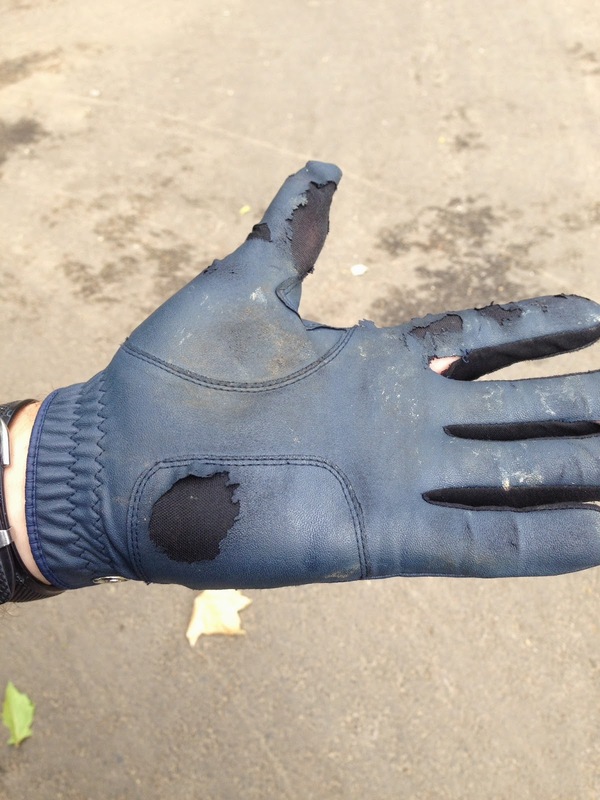 Pop out to your golf bag and have a look at your golf glove.... if it looks like the one above keep an eye out for my next blog which which will give you some simple drills to make the changes and save you money!!!! The past week has been a complete inspiration for myself and for the game of golf which never ceases to amaze me after 25 years of involvement within the industry. My direction has changed completely since 2005 when I had to stop competing on the Ladies European Tour due to a serious balance disorder, however 5 years of rehabilitation with the determination and passion that this game provides enabled me to set a series of new goals which were not applicable prior to 2005. I am a believer of fate and this "road block" enabled me to progress with a positive change of direction to my now passion of coaching. Coaching is just not providing clients for 30 minutes with the tools to correct a swing fault, for me the confidence building, support and mentorship are just two of many vital areas I focus upon with my clients. My role as a PGA coach has lead me to meeting some amazing and inspirational people of which I am proud and honoured to be associated. I can now see first hand the joys and elation golf, often perceived as a singular sport can bring. I have been coaching service personnel for the past 3 years coaching in a group and an individual basis. 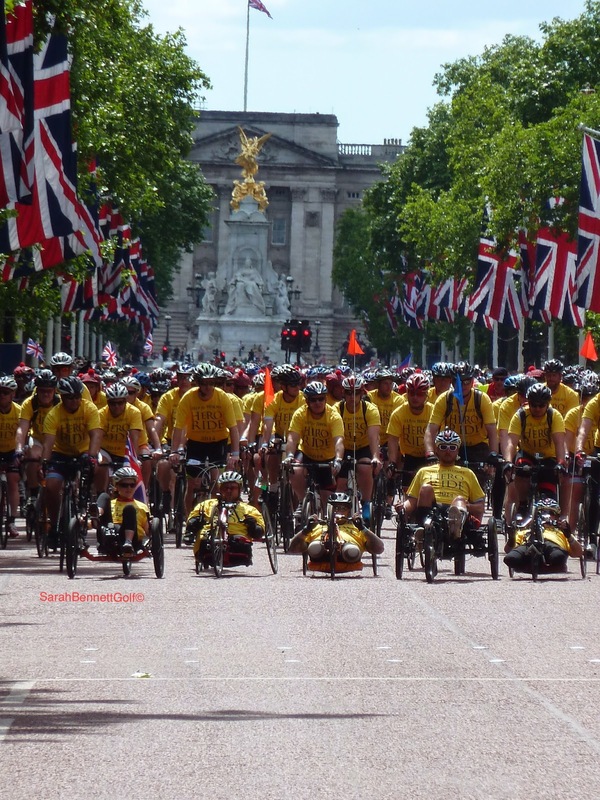 This had lead me into my voluntary work for Help for Heroes which included assisting with the Hero Ride 2014 last week which was one of the most amazing experiences to date. I would dearly love to join the chaps next year.. gym work here we come! This photo as I am sure you will agree will go down as one of my most memorable.I did not mean the cake!! I baked this in conjunction with the hero cake sale which I attended on the day and had great pleasure in learning from the residents. I attended the Chelsea flower show a few weeks ago which the Help for Heroes garden "Hope on the Horizon" showcased and was voted the peoples choice number one garden. It was spectacular and is being be transported to the recovery centre as part of an on going rehabilitation process. The designer Matt Keightley whose foresight of the project was incredible. Matt spent the time with me explaining the project and the various steps along with the significance of the garden. of golf on and off the course. I will be posting a variety of blogs which you an sign up to receive directly to your e mail account. Don't despair about the weather interrupting your golf over the forthcoming weeks, there is always something to work on when away from the course. Here is a selection of my top 5 putting aids that I use when coaching. When I select my training aids it is vital that they tick the following requirements. Each of the above putting aids can be used indoors too which is a huge bonus especially at this time of the year. They can also be used whilst travelling which was important when I played on the Ladies European Tour. Meet my top 5 in no particular order! 1. 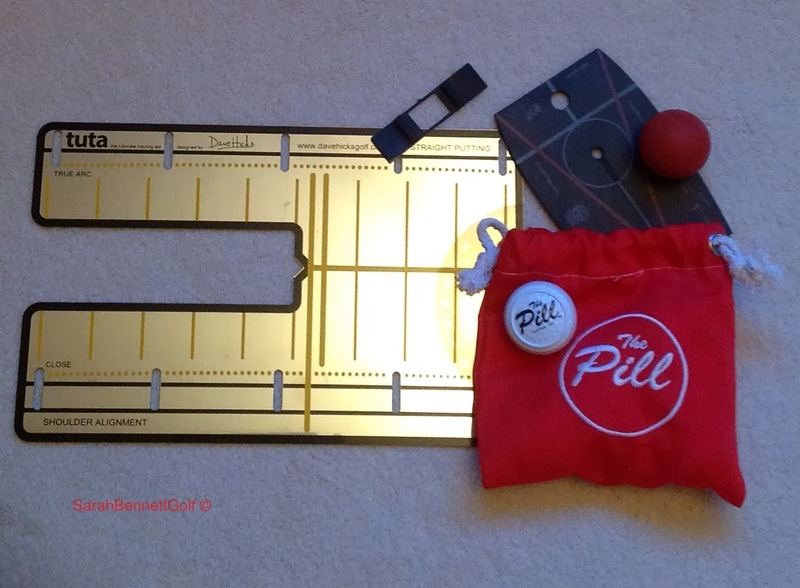 "The pill" A super addition to this years collection which relies on a "square" contact to obtain a true roll of the treaded golf ball. 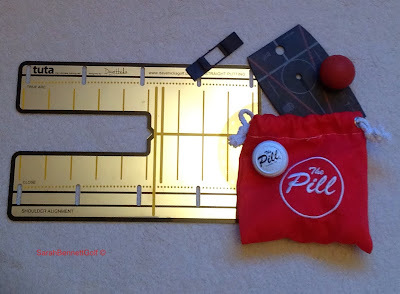 "The pill" will wobble from side to side like a weighted crown bowling ball if the ball is struck at an angle. It's versatility is second to none with numerous drills which can also be used to assist with the short game shots around the green. They are suitable for all ages and provide hours of entertainment. 2. Ball of steel: These always cause a giggle as they are heavily weighted and perfect for those players who tend to decelerate or have a curtailed follow through, to be used on short putts. Watch out when using your own golf ball after 10 minutes practise with these!!! "fore"
3.Centred strike pad: Another amusing and tricky aid which is adhered to the putter face with a small amount of tape. There is just enough of a window for the golf ball to fit. 4. Alignment triangle: Great as a mobile coach! simply check your initial aim at address is that of your intended read using the point of the triangle. This alignment aid ensures the face is square at address and not aiming right or left to start with, which will cause inconsistencies in the stroke. The ball is placed and struck from the dimple providing instant feedback. 5. Putting Mirror: This checks shoulder alignment and eye line position at address, with the added benefit of the "putting gate". Two tees are placed in the holes either side to assist with the path of the putter head. I hope you have learned how to use my winter survival putting kit. Three years ago a friend of mine said to me, “ How about trying golf? There’s a free ladies golf taster day taking place at the ‘Three Rivers Golf Club ( Cold Norton, Essex ) with Sarah Bennett, that could be fun.” It was a suggestion aimed at lifting me from the gloom of a difficult situation in life. We were trying to come up with ways of having fun and I wasn’t coming up with much! Golf? My mind wandered to failed attempts at putting balls through windmill sails and various other obstacles on crazy golf courses. I wasn’t sure that golf and I were a match made in heaven. In the event, I actually attended the day and my friend didn’t. Something like, “Oh well, I’ve nothing better to do.”, pushed me through the doors of the golf club and into a whole new world! That day spent with Sarah Bennett PGA Head Professional and former Ladies European Tour player, a group of strangers and some interesting things called seven irons has changed my life in a way that I could never have anticipated. Previously, I had avidly watched the ‘Ryder Cup’ and other major tournaments on T.V., but it was a sport that I had never considered playing. 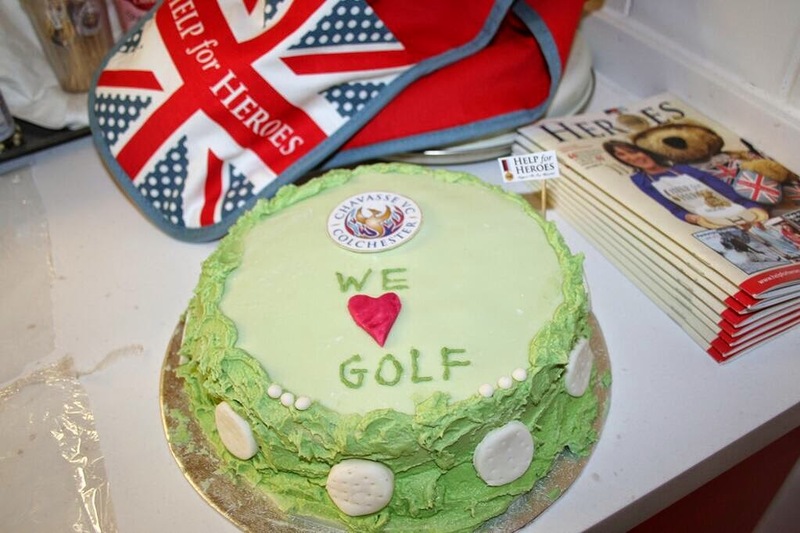 Perhaps it’s an age thing, I am now 54 and it had always seemed to me that golf was a mysterious world that men inhabited – I’m sure that some of them wish it remained that way! However, during the last three years, I have attended group lessons taken by Sarah, ventured out onto the course, attended some of Sarah's Bennett's birdies fun ladies golf days and gradually posted a score for my fist 18 holes that a batsman would be proud of! Getting out in all weathers (! ), I have had something to focus on that has given me a balance to my life, when everything else in it was on shifting sands. There is something amazing about striking the ball well (for once!) and watching it sail through the air, something wonderful in the laughter with new found friends when your ball falls pitifully back into a bunker and something strangely satisfying in rolling up to the clubhouse, soaked, with the prospect of a hot drink, a sandwich and the camaraderie of those friends to share it with! L - learning many new skills, which can be frustrating and brilliant rolled into one. For me, golf has been a wonderful gift to my life so far. I am learning more about myself, as I learn more about how to play. Sarah’s patient instruction has inspired me with more confidence in my ability to do new things, I have made some fantastic new friends and these days, as the festive season approaches, rather than ‘Dreaming of a White Christmas’, I’m dreaming of a new driver! This “from the heart” blog from one of my Get into Golf Ladies just shows the transformation golf can bring, just having the courage to take the first step......why not have a go? Last week one of my clients asked if I was going away? 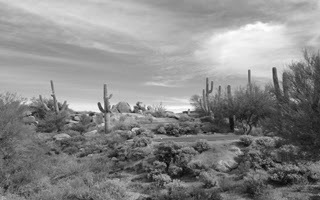 At which point I enthusiastically said " I have just returned from Scottsdale on my Golf trip" I then started to explain how picturesque and tricky the courses were, which prompted me to write this my second blog on Golf hazards in the desert! The weather in November was unseasonably warm however in the mornings and after sunset a light jacket was the order of the day. The mornings were around 50 degrees F after which it rapidly warmed up to 90 degrees. So preparation was the key, so pack the water, hat, sunscreen and lipbalm, it was so dry it felt as if you had cling film across your face! The first question everyone asks when checking into the Pro shop is about the Rattlesnakes... yes I am sure they are watching every errant golf shot but rarely seen.The many notices on the course just reminded you that this was their habitat! Apparently Bob cats have been seen at Grayhawk along with Arizona wild pigs (javelinas)scorpions or even a gila monsters (lizards) Apart from the natural hazards, which I did not see any !!! are the ones we golfers put ourselves in..... 20 ft cactus! I was the ultimate tourist snapping away but this took my mind off the narrow lush fairways. Unfortunately I paid the price missing the narrow slithers of fairways meandering through the desert, so try using a 3 wood to keep the ball in play and keep away from the Seguana Cactus, which seem to jump out at every opportunity. Remember you need to identify your golf ball to take the one shot penalty rule or treat the ball as lost...If you do stray from the fairways be careful not to tread on any loose cactus spines, I am sure I still have one in my foot. ouch! The courses are generally closed for two weeks during October for over seeding ready for the cooler temperatures over the winter so pick your time to visit carefully!! The greens are very undulating and firm so try using a softer golf ball as the altitude increases the ball will fly further so distance is an added bonus. A day of golf in the desert is not complete without the wilderness Arizona sunset.. but be quick it disappears as quickly as your Pro V 1 golf balls.